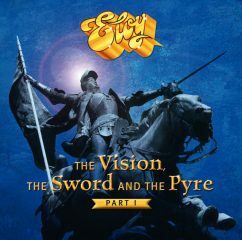 On the 25 August 2017 Part 1 the album The Vision, the Sword and the Pyre will be released onto the music market. This first version of an epic project is an interpretation by the pioneering German progressive rock band ELOY. Composed, directed and produced by Frank Bornemann, head of the internationally respected German rock legend, the work is dedicated to the life and acts of the late Middle Age French heroine Joan of Arc, canonised in 1920, and combines unique musical complexity with absolute and unbiased historical precision. ELOY aside, Frank Bornemann is an acclaimed supervisor and producer of well-known bands of different musical stripes (including Scorpions, Guano Apes and Revolverheld). Following his own band’s sensational return to the stage after 13-year break and the live concert recording on CD and vinyl, which made it into the Top 40 of the German album charts, the Grand Seigneur of prog rock has now decided to crown his extraordinary career with a further highlight that’s bound to create a storm of interest among the band’s international fanbase and the wider record-buying public. The Vision, the Sword and the Pyre was however initially conceived as an elaborate spectacle musical for the French stage under the title of La Vision-l´épée et le bûcher. However, the ELOY mastermind and his band have recorded the coming album in English. This first version of the work is now to be released as two separate albums. Neither the band nor the stage production contain the type of sung dialogue common to most musicals and rock operas, and this decision, according to the author, distances it from all previous works in the genre and frees up more powerful and expressive possibilities. The historical figures express their thoughts through song with poetic and lyrical refinement. The few spoken passages are likewise accentuated by correspondingly atmospheric music. All the titles of course contain vocal contributions that lead the listener through the action, from brachial choirs á la Carl Orff to delicate children’s voices. A further innovation is surely the involvement of numerous and illustrious guests on the band album. This makes for many truly exceptional and surprising moments on the band album. Among the highlights are the emotionally moving passages from Alice Merton as Joan of Arc. The Canadian singer is currently enjoying sensational chart success in Germany and increasingly internationally. Award-winning German blues queen Jessy Martens also makes an impressive solo contribution. While the list of special contributions goes on, not everything needs to be given away here. In this way, the first encounter with this extraordinary work will remain a surprising adventure.